A grateful Clitheroe grandfather is set to trek Africa’s highest mountain with his friend, Wayne Ellison, to raise money and say “thank you” to Alder Hey Children’s Hospital, Liverpool. Since the death of his baby granddaughter, Lillian Florence in 2004 to a rare heart problem, Derek Russell has raised over £35,000 while his wife, Sharon, and daughter, Amelia, have also raised above £15,000 towards the hospital site. Thursday, October 4th, will see Gisburn resident Wayne and Derek trek for seven days, covering over 35 miles to climb the 5,895 metres high Mount Kilimanjaro. It will also expose them to extremes of temperature and altitude sickness. The duo aim to raise £1 for every metre of “Kili”; a combined total of £11,990. 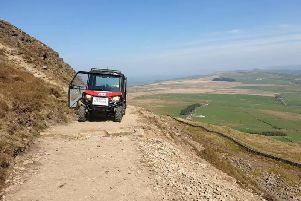 The daredevils estimate that since the turn of the year they have trekked over 300 miles together and in doing so have climbed Snowdon and Ingleborough twice, as well as Whernside, Loughrigg Fell, Darwen Tower, Parlick Hill and Pendle - the latter in excess of a dozen times! Derek, a retired financial advisor, said: “Despite the elements best endeavours - thick mist, rain, and strong, freezing cold winds - we smashed it! The day was especially rewarding for us because six of the other 14 challenge participants joined us for the day. It was great to meet them before we set off for Tanzania.” Since Lillian’s death, fundraising events organised by Derek also include the Hey Clitheroe concert, a night of music and entertainment, which has raised £17,500. Anyone wishing to support their latest challenge, can do so by donating via www.justgiving.com/fundraising/wayne-ellison4 or www.justgiving.com/fundraising/derek-russell5.